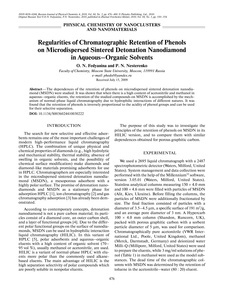 The dependences of the retention of phenols on microdispersed sintered detonation nanodiamond (MSDN) were studied. It was shown that when there is a high content of acetonitrile and methanol in aqueous—organic eluents, the retention of the studied compounds on MSDN is accomplished by the mechanism of normal-phase liquid chromatography due to hydrophilic interactions of different natures. It was found that the retention of phenols is inversely proportional to the acidity of phenol groups and can be used for their selective separation.